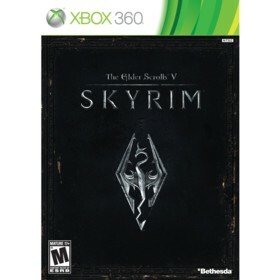 The Elder Scrolls V: Skyrim is a Xbox 360 game in the RPG genre. The game was published by Bethesda Softworks and developed by Bethesda Game Studios. The game has an ESRB Rating of M (Mature 17+) and was released on 2011-11-11. The game's official site can be found at www.elderscrolls.com. I picked up Skyrim at launch this past Friday and have poured about fifteen hours of time into it so I thought I would give some initial thoughts regarding the game. I will start with the strengths of the game: the gameworld itself is massive in scope with even more things to do than Oblivion. The quests themselves aren't the typical fetch quests and kill quests of most other open world games (though there are a few of those) - Bethesda has put a lot of thought and originality into them so they are much more entertaining than the standard mindless fare. I feel as though I've barely scratched the surface of what Skyrim has to offer. Another amazing feature is the ability to mold your character into almost anything - there are no set "classes". You can become something as outlandish as a sorcerer that uses an axe to take on his opponents in close-range battle - the choice is really up to you. Finally, the world is extremely immersive and believable - from the people you meet along your journey to the amazingly detailed environments - everything just gels together really well. The prime weakness of this game are the numerous bugs and glitches. Sometimes the actions of the NPC's make no sense at all. For example, one time I was in a fight with a female NPC, her husband walks in on the conflict and decides to attack her instead of me. Another time I was able to put a basket on an NPC's head and steal an item from them - and they had NO idea that something was stolen and weren't the least bit concerned that a basket was on their head :). Another minor quibble is that due to the aforementioned freedom to create your character, you can end up having a difficult time with later enemies since your stat distribution was bad early on. Finally, some of the enemies attack patterns and behavior are extremely predictable and stupid - hardly making them worthy adversaries. I can't count the number of enemies I've been able to walk off the edge of a cliff :). Luckily, all of these weaknesses can be easily fixed with future patches. Overall, while Skyrim is currently far from being "perfect", it does enough really well that it is easily my favorite game of the year thus far. I'll likely pour well over one hundred hours into this game and still be able to find new and interesting things to do. It is well worth the $60 price tag given the sheer amount of content in the title. Also, I should note that I have done a fair bit of research regarding comparisons between the Xbox 360 and PS3 versions of the game since I have both consoles and needed to decide which one to get it for. From my research it was clear that the Xbox 360 version of the game had superior graphics as long as you don't install the game to your harddrive (Bethesda is reportedly fixing this bug - it has something to do with streaming the games textures). I'm just mentioning this because you should be wary of comparisons between the two systems on certain sites since they have installed the 360 version and comparing it to the PS3 version resulting in the PS3 version having better graphics. Both versions look great, the 360 is just slightly better - plus, the 360 version gets all the DLC for the game one month earlier than the PS3 version which also helped make my decision a little easier. I definitely recommend picking up this game - it will last you well into the new year.